^ Ibn Iyas, Muḥammad ibn Aḥmad (1955). Wiet, Gaston (trans.) (ed.). Journal d'un Bourgeois du Caire, vol. II. Paris. p. 67. Amitai, Reuven (2006). "The logistics of the Mamluk-Mongol war, with special reference to the Battle of Wadi'l-Khaznadar, 1299 C.E.". In Pryor, John H. (ed.). Logistics of Warfare in the Age of the Crusades. Ashgate Publishing Limited. ISBN 9780754651970. Binbaş, İlker Evrim (2014). "A Damascene Eyewitness to the Battle of Nicopolis". In Chrissis, Nikolaos G.; Carr, Mike (eds.). Contact and Conflict in Frankish Greece and the Aegean, 1204-1453: Crusade, Religion and Trade between Latins, Greeks and Turks. Ashgate Publishing Limited. ISBN 9781409439264. Clifford, Winslow William (2013). Conermann, Stephan (ed.). State Formation and the Structure of Politics in Mamluk Syro-Egypt, 648-741 A.H./1250-1340 C.E. Bonn University Press. ISBN 9783847100911. Garcin, Jean-Claude (1998). 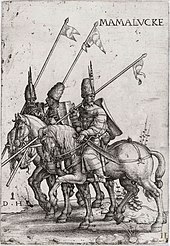 "The Regime of the Circassian Mamluks". In Petry, Carl F. (ed.). The Cambridge History of Egypt, Volume 1. Cambridge University Press. ISBN 9780521068857. Al-Harithy, Howyda N. (1996). "The Complex of Sultan Hasan in Cairo: Reading Between the Lines". In Necipoğlu, Gülru (ed.). Muqarnas: An Annual on the Visual Culture of the Islamic World, Vol. 13. ISBN 9789004106338. Herzog, Thomas (2014). "Social Milieus and Worldviews in Mamluk Adab-Encyclopedias: The Example of Poverty and Wealth". In Conermann, Stephan (ed.). History and Society During the Mamluk Period (1250-1517): Studies of the Annemarie Schimmel Research College. Bonn University Press. Holt, Peter Malcolm (2005). "The Position and Power of the Mamluk Sultan". In Hawting, G.R. (ed.). Muslims, Mongols and Crusaders: An Anthology of Articles Published in the Bulletin of the School of Oriental and African Studies. Routledge. ISBN 9780415450966. Northrup, Linda S. (1998). 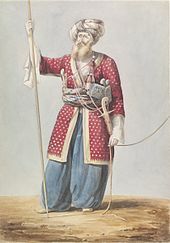 "The Bahri Mamluk sultanate". In Petry, Carl F. (ed.). The Cambridge History of Egypt, Vol. 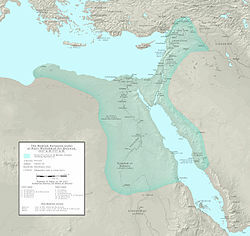 1: Islamic Egypt 640-1517. Cambridge University Press. ISBN 9780521068857. Petry, Carl F. (1998). "The Military Institution and Innovation in the Late Mamluk Period". In Petry, Carl F. (ed.). The Cambridge History of Egypt, Vol. 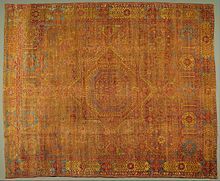 1: Islamic Egypt, 640-1517. Cambridge University Press. ISBN 9780521068857. Rabbat, Nasser (2001). "Representing the Mamluks in Mamluk Historical Writing". In Kennedy, Hugh N. (ed.). The Historiography of Islamic Egypt: (c. 950 - 1800). Brill. ISBN 9789004117945.
van Steenbergen, Jo (2005). "Identifying a Late Medieval Cadastral Survey of Egypt". In Vermeulen, Urbain; van Steenbergen, Jo (eds.). Egypt and Syria in the Fatimid, Ayyubid and Mamluk Eras IV. Peeters Publishers. ISBN 9789042915244. Teule, Herman G. B. (2013). "Introduction: Constantinople and Granada, Christian-Muslim Interaction 1350-1516". In Thomas, David; Mallett, Alex (eds.). Christian-Muslim Relations. A Bibliographical History, Volume 5 (1350-1500). Brill. ISBN 9789004252783. Winter, Michael (1998). "The Re-Emergence of the Mamluks Following the Ottoman Conquest". In Philipp, Thomas; Haarmann, Ulrich (eds.). The Mamluks in Egyptian Politics and Society. Cambridge University Press. ISBN 9780521591157.